These Shrimp and Bacon Stuffed Deviled Eggs are going to go fast. Double the recipe, my friends. 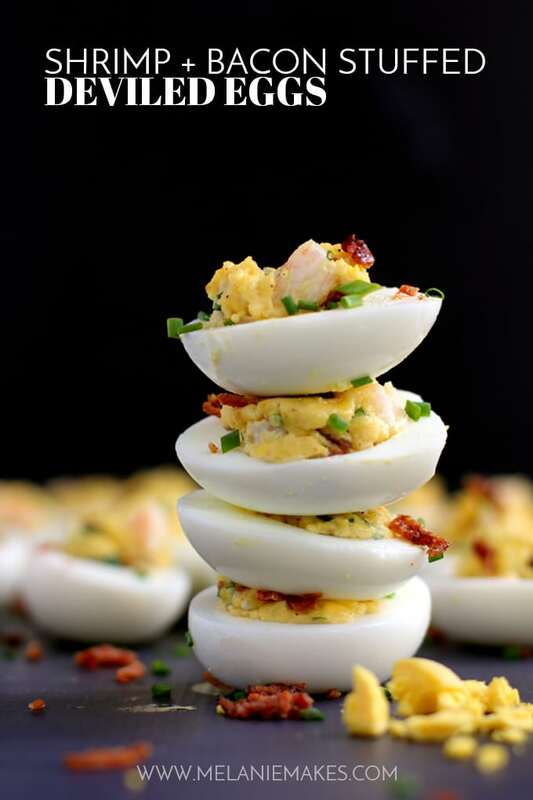 The traditional deviled egg goes upscale with the addition of shrimp and bacon, becoming an instant dinner favorite. The countdown to Easter is on. It’s less than two weeks away people! And no matter how you celebrate, if you gather around a table to share a meal with friends and family, I would make a quite educated guess that there will be deviled eggs served. Am I right? Thought so. I mean, is there a better side dish for such a spring holiday? I think not! 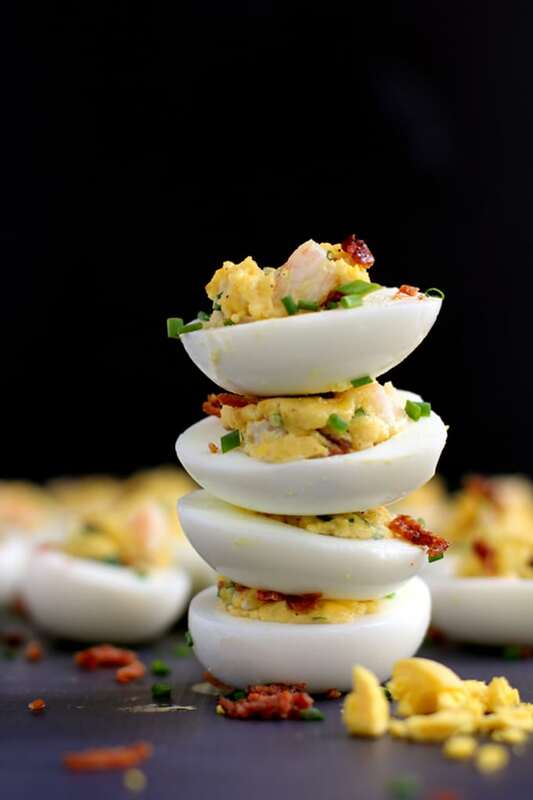 So instead of the ordinary, why not put forth a little extra effort – key word, LITTLE – and dress things up a bit with these Shrimp and Bacon Stuffed Deviled Eggs. Simply put, in our home, we believe you can never go wrong with the addition of bacon to a dish. I first made these Shrimp and Bacon Stuffed Deviled Eggs during our first year in Madison. We were away from family and decided to invite Andy’s chief resident and wife over for dinner. It seems like eons ago as they now have three children as do we. That’s something I love about spending so much time in the kitchen. I associate dishes with who I’ve shared them with. And meals are always best when gathered with friends and family. And just in case you’d like to serve something more than deviled eggs for your holiday meal, they pair well with my Slow Cooker Honey Mustard Ham and my Cheesy Corn Casserole. 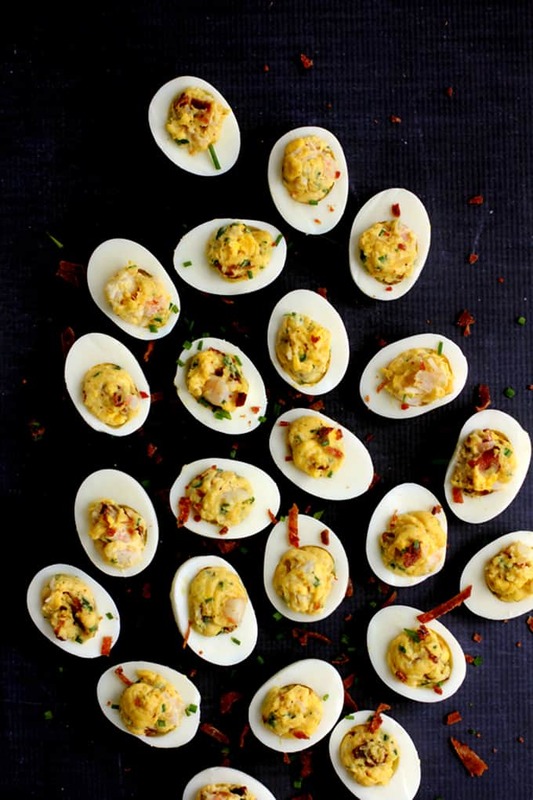 Or if these Shrimp and Bacon Stuffed Deviled Eggs aren’t fun enough for the younger crowd, they’re guaranteed to fall in loved with my Dyed Deviled Eggs. Who says you can’t play with your food?! 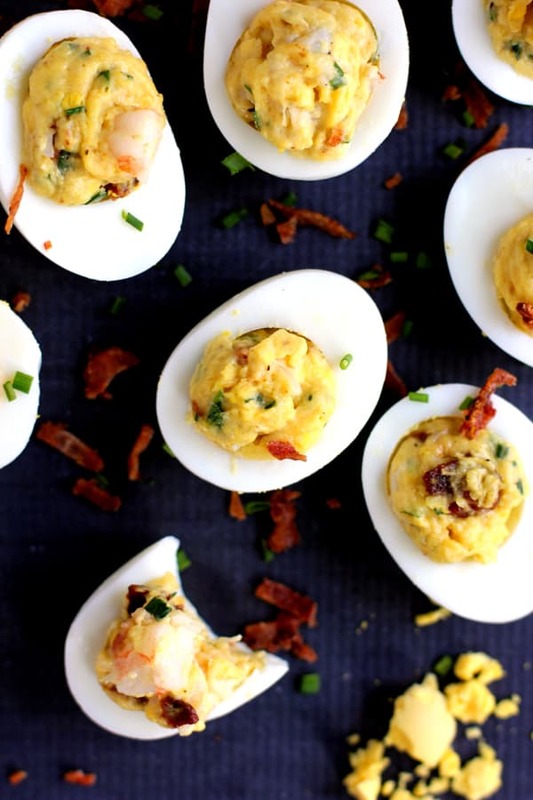 These Shrimp and Bacon Stuffed Deviled Eggs are just as their name implied, stuffed with all the good stuff! Spiked with mayo, mustard and a pinch of cayenne and sprinkled with parsley and chives. These eggs are definitely holiday ready! Did you notice anything unusual in the ingredient list? Perhaps the instant potato flakes? Something I rarely have on hand except for this dish but they lend such a great texture to the filling of these eggs. They also work to thicken it a bit as well. Perfect! To make things a little less messy, I like to spoon the filling into a pastry bag and pipe into each egg white halve but definitely feel free to just spoon it in as well. Your choice. They taste just as amazing either way. If you’re asked to bring a side dish or appetizer to your next holiday gathering, you can bet that these Shrimp and Bacon Stuffed Deviled Eggs are going to be well received. So much better than the plan and traditional and yet not difficult whatsoever! Cut cooked eggs in half lengthwise and remove yolks. Mash together 8 yolks in medium bowl, reserving remaining yolks for another use. Stir in potato flakes and all other ingredients through chives. Fold in shrimp and crumbled bacon. Spoon approximately 1 heaping tablespoon of yolk mixture into each egg white half. Garnish with additional chives and bacon, if desired. There’s a reason why I always keep a minimum of three dozen eggs in our fridge! These egg recipes definitely deserve a spot on your holiday menu as well. This easy overnight Eggs Benedict Strata, delicious Spinach and Mushroom Egg White Frittata and Bacon and Egg Toast Cups would certainly be well received! These sound delicious! Dangerously good... Oooh, these look heavenly! Such a simple yet delicious finger food! Bacon make everything better, right?! Love the idea of shrimp and bacon together! We're definitely on the same page about bacon! What an incredible mix of my favorite flavors! Can't wait to try this! I've added bacon before but adding shrimp too is such a great idea! So much flavor! My family likes plain deviled eggs but have never tried it with the shrimp and bacon, can't wait to try it and see what they think. It looks like a new, very good and interesting way of having deviled eggs. I think you'll absolutely love these, Terri - let me know what you think if you give them a try! Everything I love in one post! And in handy bite size form as well, Lexi! I'm not sure when I started liking deviled eggs. I never grew up with them, so it wasn't from my childhood. But now I can't get enough of them. These look so good and perfect for a holiday gathering. Thanks so much, Brian - we loved this dressed up version! My husband is a deviled egg "enthusiast" and I know he has never seen a recipe like this one. Can't wait to hand the recipe over to him and await the results! Thanks! Hey, Karen - let me know what you think if you give them a try! These look PERFECT. I love the addition of bacon and shrimp! Thank you for your kind words, Bianca! These look wildly delicious, Melanie! 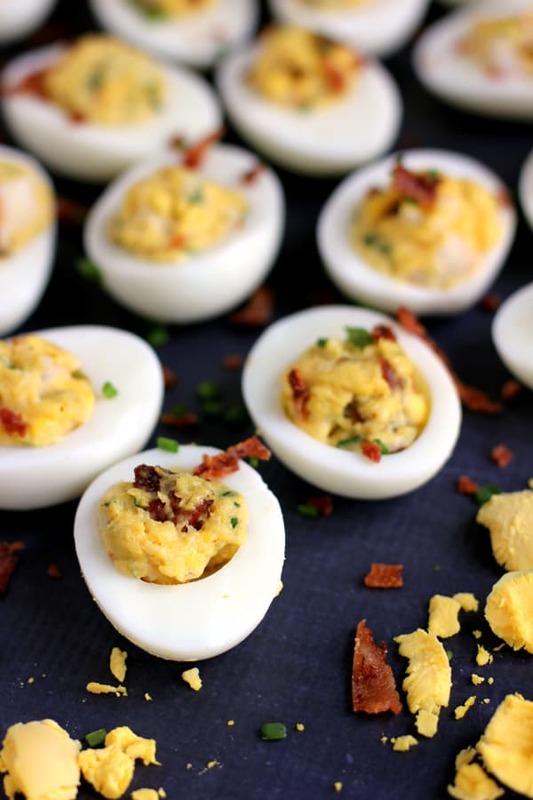 I've certainly never had such a classy deviled egg and would LOVE to try these. Pinning. Thank you sou much for the kind words - let me know if you give them a try! How is it already Easter? 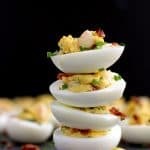 Where has the year gone, craziness I tell you!Loving this amped up deviled eggs recipe, especially with the shrimp and bacon addition. I can't remember the last time I made deviled eggs but after seeing this, girl.... its on the menu. Pinned! Melanie, I tried your recipe and it turned out great. Thank you for sharing this with me, shrimp and favor bacon was awesome. Thrilled to hear you enjoyed them, Michael - thanks so much for letting me know!